A few days ago, we spoke about the importance of businesses building a strong social media presence. Facebook, of course – with it’s 1 billion+ users and more than half-a-billion active users – has the highest appeal for businesses, and remains the focal point for many businesses and corporations looking to build, enhance and strengthen their social media footing. Today, let’s talk EdgeRank – or Facebook EdgeRank to be precise. In very simple terms, EdgeRank is a an algorithm used by Facebook that determines what relevant stories are displayed in any user’s Facebook stream, as well as their order. Essentially, it is EdgeRank that doesn’t show your posts to all your fans and followers. It can be a bit frustrating, since you work to build a large base of fans and followers on your Facebook business page, only to discover that a small percentage of those fans – somewhere around 10% to be precise – can actually see your posts and updates. Therefore for businesses, understanding how EdgeRank operates is essential. This vital information allows marketers to beat EdgeRank, and reach out to a wider audience. It also allows them to increase their exposure, get more ‘Likes’, build a strong following on Facebook and generate leads and drive traffic through Facebook. A simple Google search on EdgeRank will lead you to a ton of resources on how this algorithm operates. However allow me to explain – I’ll try keeping it as easy as possible. EdgeRank is an algorithm developed by Facebook to govern what is displayed—and how high—on the News Feed. The algorithm operates on an Edge, which is essentially any action that happens on Facebook. Actions include likes, comments, status updates and shares, to name a few. Affinity: The website describes affinity as a one-way relationship between a Facebook user and an Edge. Affinity is built by repeat interactions with a brand’s Edges. Actions such as Commenting, Liking, Sharing, Clicking, Views, and even Messaging can influence a User’s Affinity. So the higher engagement a person has with your brand page, the higher their affinity score. Getting your fans to interact with you increases the affinity – and this is precisely what you want to be doing. Weight: A system created by Facebook to increase/decrease the value of certain actions within Facebook. Posting a comment is more involved and therefore deemed more valuable than a Like. In the weighting system, Comments would have a higher value than a Like. In this system all Edges are assigned a value chosen by Facebook. As a general rule, it’s best to assume Edges that take the most time to accomplish tend to weigh more. In addition, certain updates are given more weight than others: videos > images > links > text. Time: Refers to how long the Edge has been alive; the older it is the less valuable it is. As an Edge ages, it loses value. This helps keep the News Feed fresh with interesting new content, as opposed to lingering old content. Ultimately, it is all these set of elements that come together in order to determine your business’s page’s reach. And it is because of EdgeRank that it’s become difficult for businesses to reach their audience on Facebook. 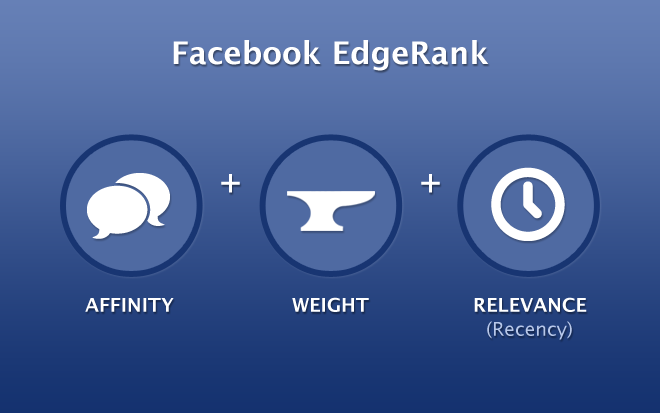 There are certain ways in which EdgeRank can be beaten in order to bring more exposure to your Facebook page. There are actually quite a few things that you can use to beat EdgeRank, increase your exposure on Facebook, bring more traffic to your page, and ensure that your updates get across to a wider audience. 1. Post quality content: Engage a large number of people by post interesting, quality content. The better your content, the more people will see it, like your posts and share your content, increasing your affinity in the process. Above all, post content that is relevant, and allows you to connect with your fans, once way or the other. 2. Increase engagement: One of the best, sure-fire ways of increasing engagement on your page is to post engaging content and updates. Images are said to be much more attention-grabbing, garner more attention, and hence have a much higher engagement level. Besides, EdgeRank loves images! Videos too provide a higher level of engagement than simple text-based updates. Other ways to increase engagement would be through polls, posting thought-provoking updates that automatically encourage feedback, and asking questions through updates. Engagement also increases the weight of your updates. 3. Two-way communication: Remember that two way communication is essential on Facebook – and indeed all social mediums. You need to encourage people to share their thoughts with you, instead of spamming them with links or overwhelming them ads. Conversely, it is just as vital to respond to any comments and questions on your Facebook page promptly. 4. Frequency and timing: Both these are essential, especially when sending out an update. Post frequently, so that you remind people about your existence but don’t spam them. Study trends (Facebook pages come with a pretty powerful analytics module built-in, called Facebook Insights) and experiment with different timings in order to determine when your fans are online and respond to your updates. Alternatively, you can use Analytics Pro, a social media analytics suite, to do this for you. 5. Create a Facebook update schedule: Develop a social media schedule as part of your social media strategy. A schedule is something that’s as simple as posting frequency: what and when will you update your page. Post updates at times when your the people you’re targeting are using Facebook and are responsive to your updates. Or time your updates according to an event (live coverage, or immediately after an event, for instance). Timing is essential. 6. Avoid using 3rd-party programs: While programs and apps such as HootSuite make life easier – and I almost always recommend using these in order to manage multiple profiles and schedule updates – Facebook and in particular EdgeRank seems to dislike these programs. Instead, post all updates on Facebook directly through your browser. 7. Adapt: People’s surfing habits and trends change almost as frequently as algorithm updates. Be ready to adapt, respond to changes and tweak your social media strategy accordingly. 8. Sponsored stories: At the end of the day, you always have the option to buy ad space on Facebook. Ads are dirt-cheap (well, depending on the type of ad and the audience it targets), and if you target your ad correctly, can provide a pretty great ROI. For me, affinity – or rather increasing the affinity – is key. Business pages should should aim to increase the affinity each fan has with your page. As mentioned above, post updates that are highly relevant to your audience, and hence updates that people on your page are more likely to interact (like, share, comment) with. In addition, to increase the engagement levels, ask questions. Involve your fans by asking questions, but draw a line as to what sort of questions you should be asking. Understand that it is not only perfectly okay to post updates that might not be relevant or related to your business, it is actually good to do so every once in a while. If you find something interesting online, and think it would make for a good share, by all means go ahead and share it. The idea is to connect with your fans in any way that you can. Increasing the weight of an Edge is simple: try posting updates that are more involving, and try engaging your audience through different ways, methods and techniques. Encourage them to share your posts, and/or leave a comment. Facebook, if used properly, can be an effective, profitable tool in your arsenal. Understanding how the algorithm driving this social platform works is absolutely essential. Some might say it is unfair that Facebook restricts you from reaching out to your own fans, and asks you to pay money to do so. From a small business perspective, that is true. However EdgeRank can be beat using a simple set of techniques. How has EdgeRank affected your Facebook page, and how did you react to it?